I really don’t know what my favorite pie is, honestly. I can’t pick, please don’t make me. 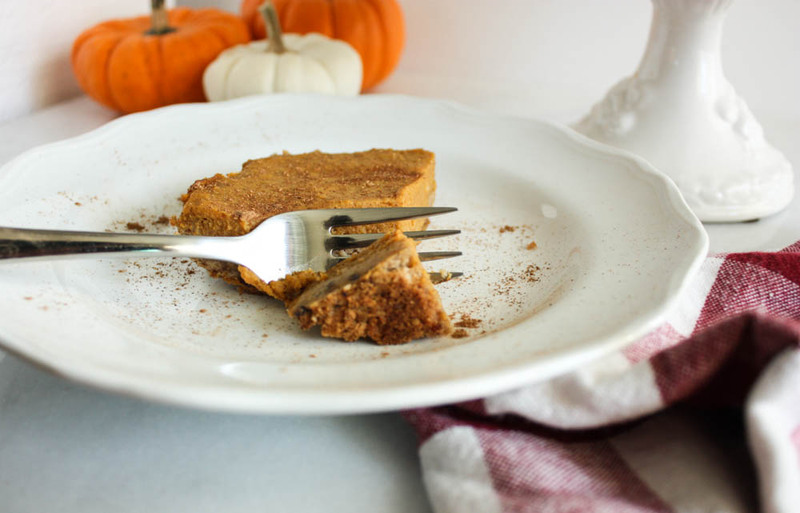 But when it comes to choosing pie for breakfast (which tends to happen during the holidays) Pumpkin Pie is always my first choice. This is a family tradition of mine. We all come downstairs, brew a pot of coffee, and see who can pile more whipped cream on their slice of pumpkin goodness. 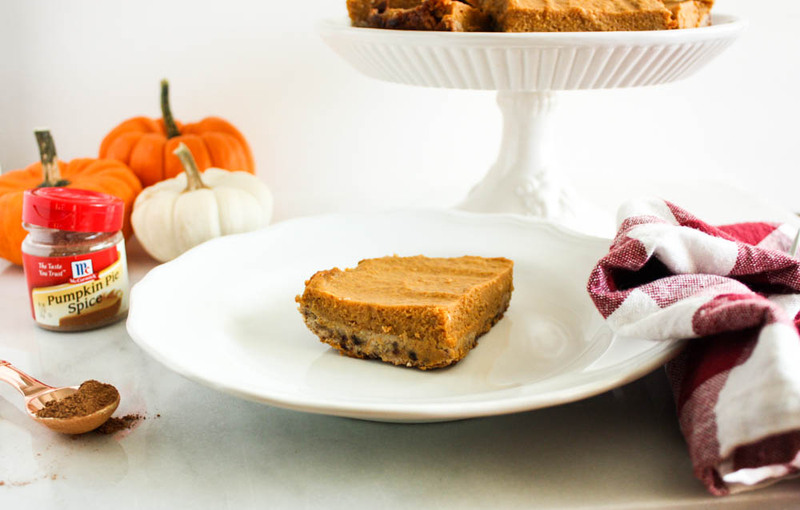 As much as I love to indulge in these little rituals, isn’t it nice when a favorite treat turns into something that can actually be good for you, too? YASSS. 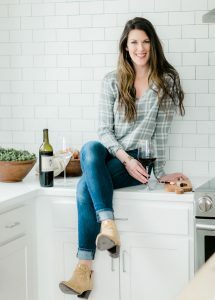 There are more than 10 ingredients here (I actually created this as a guest post on The Melrose Family a while back before my shift into dishes with 10 ingredients or less) so don’t hate me. 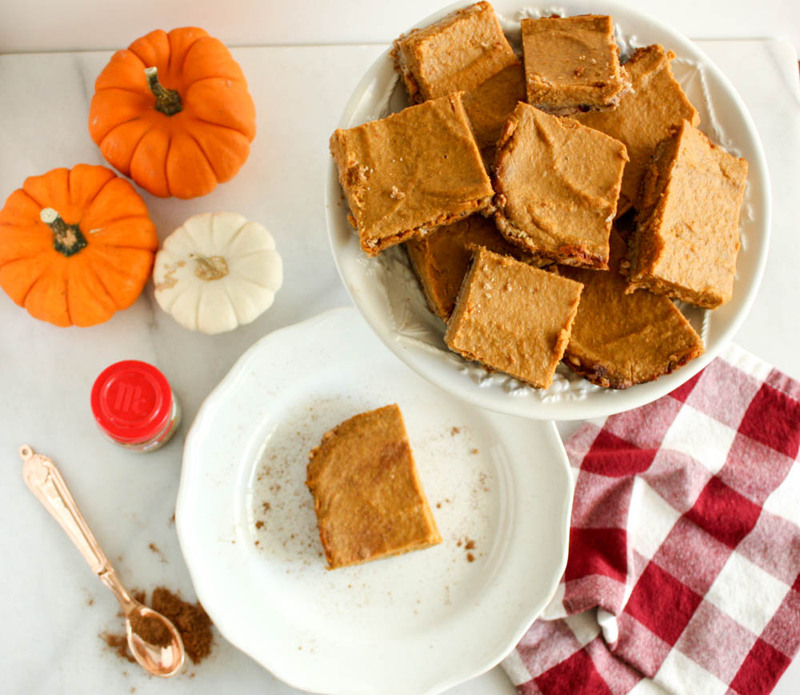 I love this treat because it is SO easy to pull together. When making traditional pie crust, you have to follow the process of chilling the dough several times, which can be time-consuming. The oat date crust here can easily be made in the blender and baked right away for convenience. Another added bonus, we’re using Greek yogurt to add a creamy texture, and to give ourselves a little protein puch. 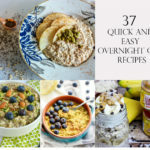 Between the oats & Greek yogurt, not only are these are decadent and flavorful, but they are healthful and filling, too! Check out the deets below. 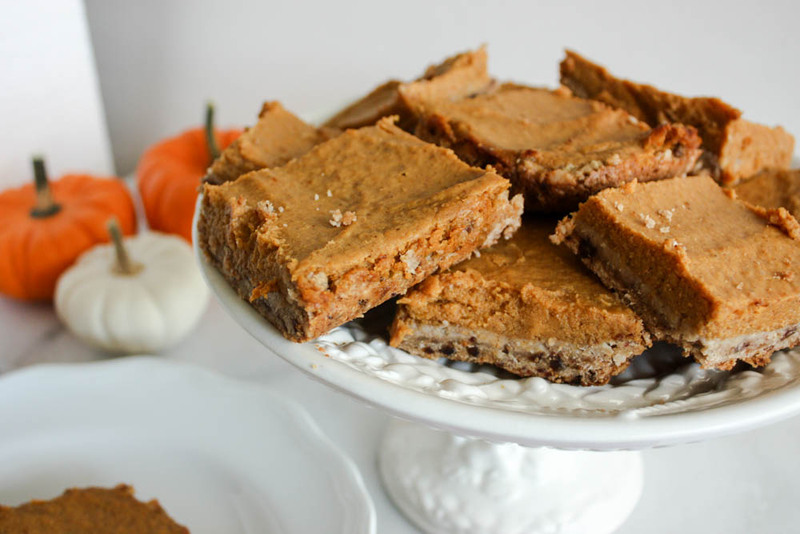 Let’s start by making that oat date crust – you’ll need a blender or food processor. 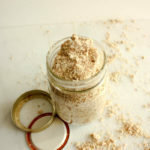 All you’ll do to make the oat flour is place 1 cup of oats into the blender/ processor and pulse until it is finely ground. Next, add the walnuts, dates, maple syrup, and coconut oil. Blend this until everything is glossy, sticky and combined. You may have to stop the machine and scrape the sides a few times. Add the rest of the whole oats, mix and push into a baking dish greased with coconut oil. Pre-bake the crust in the oven for 10 minutes. In the meantime, prepare the filling. Pour pumpkin puree, maple syrup, cashew milk, cornstarch, vanilla and spices into a bowl and whisk lightly. Beat your eggs, and pour into the filling mixture. Whisk everything together well. When the crust has finished pre-baking, pull it from the oven, pour the pumpkin filling over top and place back into the oven for 30 mins, or until the center is set and not jiggly- haha! Pull the dish from the oven and allow it to cool on a wire rack. I like my pumpkin pie cold, so I tend to let it cool overnight in the pan before slicing. These keep well wrapped in the fridge for a least a week…if they last that long! 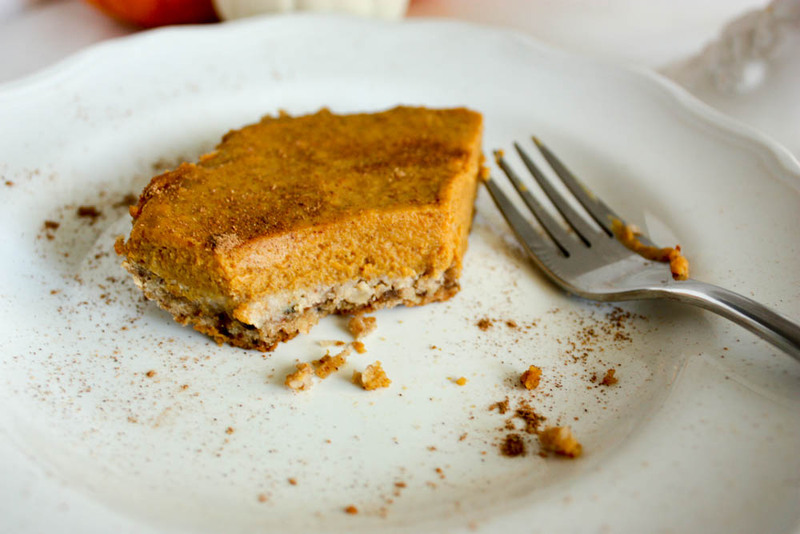 Let’s start by making the oat date crust – you’ll need a blender or food processor. All you’ll do to make the oat flour is place 1 cup of oats into the blender/ processor and pulse until it is finely ground. Next, add the walnuts, dates, maple syrup, and coconut oil. Blend this until everything is glossy, sticky and combined. You may have to stop the machine and scrape the sides a few times. Add the rest of the whole oats, mix and push into a baking dish greased with coconut oil. Pre-bake the crust in the oven for 10 minutes. 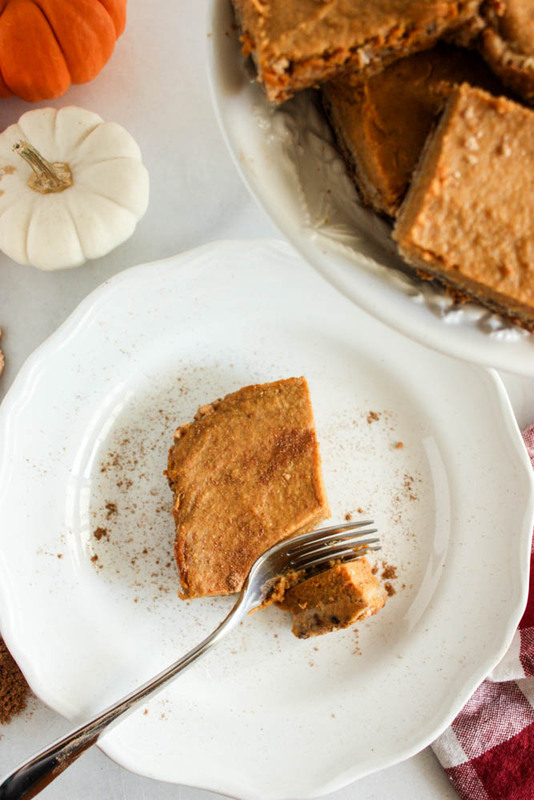 Pour pumpkin puree, maple syrup, cashew milk, cornstarch, vanilla, and spices into a bowl and whisk lightly. Beat your eggs, and pour into the filling mixture. Pull the dish from the oven and allow it to cool on a wire rack. I like my pumpkin pie cold, so I tend to let it cool overnight in the pan before slicing. I love love love anything and everything pumpkin. I love this in ‘bar’ form. Perfect for all these fall get togethers!! SO much easier than pie, right?? Ohhh my goodness. I so need to make these!! Oh, I hope that you do! I’d absolutely love to hear what you think! Me too! I can always eat pumpkin! 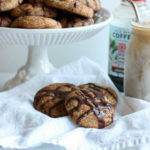 Okay, these look delicious and your photos are so festive and beautiful! They seriously are putting me in the best mood. 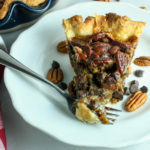 Pie for breakfast?!?!? I’m coming to your house! 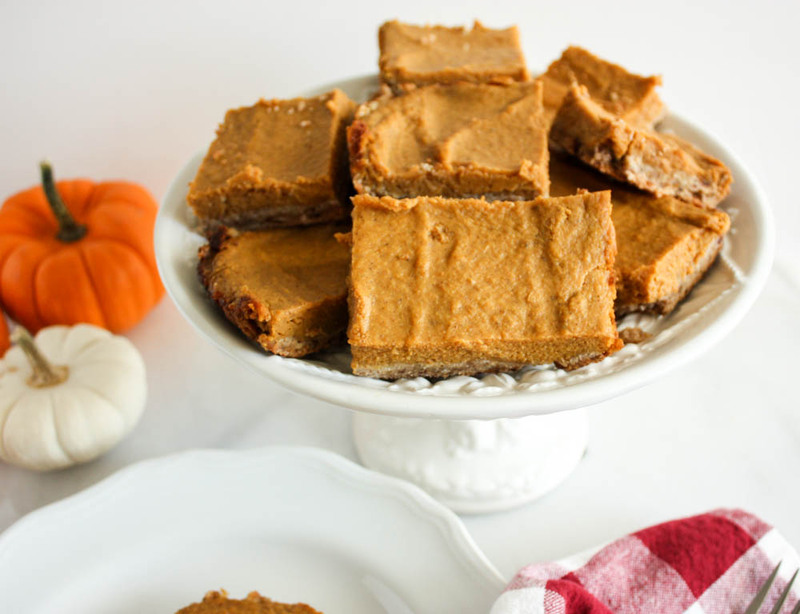 Ha ha, Allie 🙂 I hate to pick one dessert and would much rather prefer having a little bit of each 😉 These pumpkin pie bars are a great healthier treat. Happy Halloween! That’s what I do at thanksgiving! a little sliver of every kind of pie haha! And yes, please do come over!